The bible of French home cooking, Je Sais Cuisiner, has sold over 6 million copies since it was first published in 1932. It is a household must-have, and a well-thumbed copy can be found in kitchens throughout France. Its author, Ginette Mathiot, published more than 30 recipe books in her lifetime, and this is her magnum opus. It's now available for the first time in English as I Know How to Cook. With more than 1,400 easy-to-follow recipes for every occasion, it is an authoritative compendium of every classic French dish, from croque monsieur to cassoulet. Clear, practical and comprehensive, it is an essential guide to the best home cooking in the world: no cuisine is better than French at bringing the very best out of ingredients to create simple, comforting and delicious dishes. The recipes have been carefully updated by a team of editors led by Parisian food writer Clotilde Dusoulier, to suit modern readers and their kitchens, while preserving the integrity of the original book. 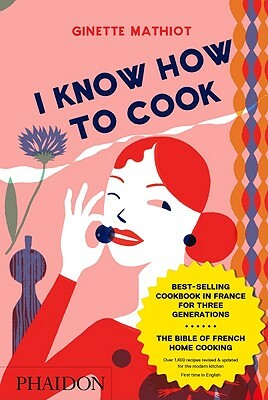 The great reputation of I Know How to Cook has been built over three generations by the fact that it is a genuine cookbook: each recipe has been cooked many times, and because it is used by domestic cooks rather than chefs. And with its breadth of recipes and knowledge of techniques, I Know How to Cook doesn't just teach you how to cook French, it teaches you how to cook, period. In the tradition of Phaidon's other culinary bibles, The Silver Spoon, 1080 Recipes and Vefa's Kitchen, I Know How to Cook offers menus by celebrated French bistro chefs at the end of the book, including recipes by Daniel Boulud and Francois Payard. Ginette Mathiot (1907-1998), Officier de la Legion d'honneur, taught three generations how to cook in France and is the ultimate authority on French home cooking. She wrote more than 30 best-selling cookbooks, covering all subjects in French cuisine I Know How to Cook was her definitive, most comprehensive work, which brings together recipes for every classic French dish. About the Contributor Clotilde Dusoulier lives in Paris. Her award-winning blog, Chocolate & Zucchini, first launched in 2003. "I Know How to Cook—all 975 pages and 5.2 pounds of it—meets this high practical standard?it includes everything you need to know—about tools, techniques, ingredient choice and menu-building—to take on almost any reasonable home-cooking challenge with Gallic flair." "A comprehensive collection...Under Mathiot's guidance, the vanilla soufflé did exactly as told, which is really all you can ask."